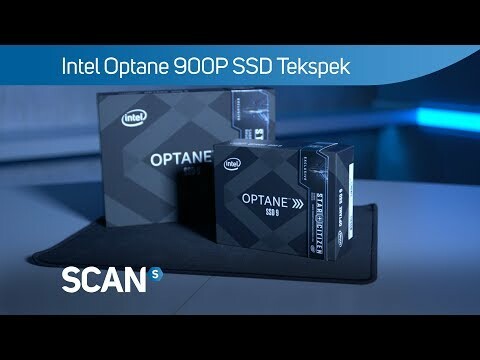 EXPERIENCE WORKSTATION CLASS PERFORMANCE The Intel Optane SSD 900p delivers workstation class performance and industry-leading endurance. This innovative storage drive is based on the new, ground-breaking Intel Optane technology, which includes the unique combination of 3D XPoint memory media with Intel’s advanced system memory controller, interface hardware, and software. With the Intel Optane SSD 900P, you can enrich your game play, fully experience your place in the galaxy, and soar to a new level. Exceptional Transfer Speed and Plenty of Capacity The Intel 900p series NVMe SSDs deliver high performance, quick system boot ups, blazing fast transfer speeds and ultimate reliability in a compact form factor. Purchase any Intel Optane SSD 900P from SCAN to receive a free Star Citizen Licence Key with an exclusive in-game ship! Fly at Quantum Speeds in the Star Citizen galaxy. Purchase an Intel Optane SSD 900P and claim the blazing fast, exclusive in-game Sabre Raven ship & a license key for Star Citizen, while supplies last. Step in, begin the journey, and inhabit a world more immersive than ever before. Superior Performance With the unprecedented level of realism in Star Citizen, you’ll want the responsive load times that the Intel Optane SSD 900P delivers. Load new planets and get fully immersed in deep space. Plus, the drive supports the seamless transition you’re called on to make from in-space dogfighting to on-the-ground combat. 5 year warranty In the Star Citizen galaxy, you can’t afford lag time waiting for critical data and information. The Intel Optane SSD 900P helps ensure you’re ready to respond and can act quickly in the game’s crucial moments. And whatever your role is in the galaxy, it requires rugged, reliable, and stable SSD performance. The Intel Optane SSD 900P comes with an Intel 5-year warranty for yet another level of protection in the Star Citizen universe. Boost system performance This Intel Optane SSD 900P includes a cable with a hard-wired adapter to connect to an available M.2 PCIe slot. This SSD will not connect directly to U.2 ports on your motherboard without an additional cable (not included). If you wish to connect an Intel Optane SSD 900P to your mothebroard via U.2, we have an alternative U.2 model which includes a U.2 cable instead. This PCI Express U.2 to M.2 adapter makes it easy to install a high-performance U.2 PCIe-NVMe SSD into your desktop PC or server and connect the drive through an M.2 PCIe x4 slot on your motherboard. By creating compatibility with newer U.2 NVMe SSDs this enterprise-class drive adapter enables you to gain faster read/write speeds and higher productivity levels for data-intensive applications.